Nitric oxide (NO) is a signaling molecule that plays a key role in the pathogenesis of inflammation. It gives an anti-inflammatory effect under normal physiological conditions. On the other hand, NO is considered as a pro-inflammatory mediator that induces inflammation due to over production in abnormal situations. NO is synthesized and released into the endothelial cells by the help of NOSs that convert arginine into citrulline producing NO in the process. Oxygen and NADPH are necessary co-factors in such conversion. NO is believed to induce vasodilatation in cardiovascular system and furthermore, it involves in immune responses by cytokine-activated macrophages, which release NO in high concentrations. In addition, NO is a potent neurotransmitter at the neuron synapses and contributes to the regulation of apoptosis. NO is involved in the pathogenesis of inflammatory disorders of the joint, gut and lungs. Therefore, NO inhibitors represent important therapeutic advance in the management of inflammatory diseases. 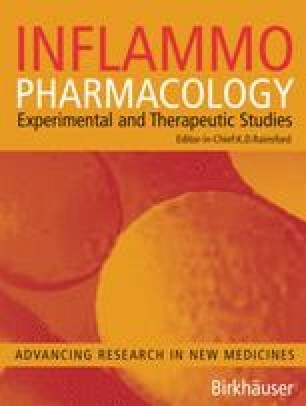 Selective NO biosynthesis inhibitors and synthetic arginine analogues are proved to be used for the treatment of NO-induced inflammation. Finally, the undesired effects of NO are due to its impaired production, including in short: vasoconstriction, inflammation and tissue damage.